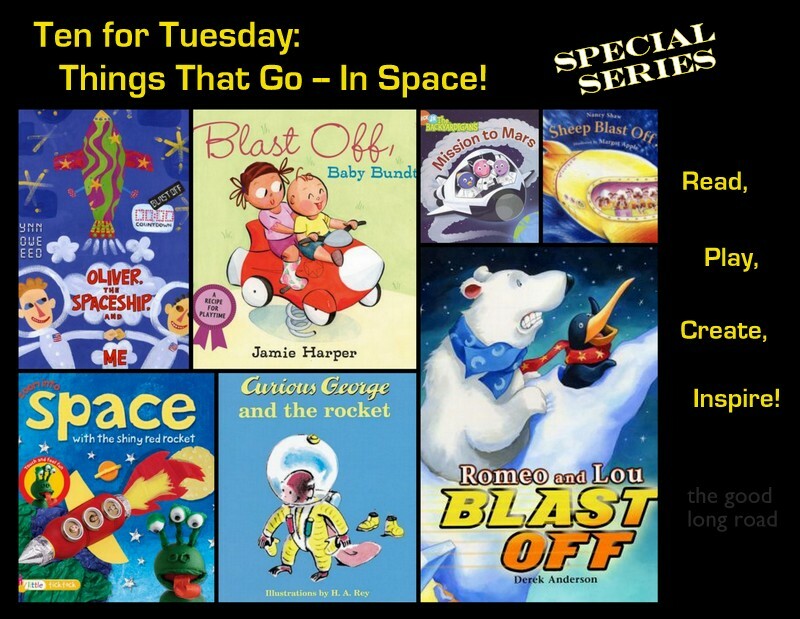 Kids love to blast off into their imaginations as they read books about outer space. Outer space is a fun preschool theme to explore. Young children are fascinated by the stars, moon, and sky. In my house, having a count down 5-4-3-2-1, followed by a loud "blast off" is necessary before nearly every event. My three year old often has to fly a rocket to dinner. And my five year old, Logan, loves to take down aliens with his imaginary tazer. Outer space captures the imaginations and interests of preschool children. Picture books can help children to explore these far out concepts. Kids can learn facts about outerspace. They can imagine a journey to space. They can wonder about aliens and imagine what it might be like to meet an alien. Outer space is also a theme that works nicely when pairing fiction and nonfiction. 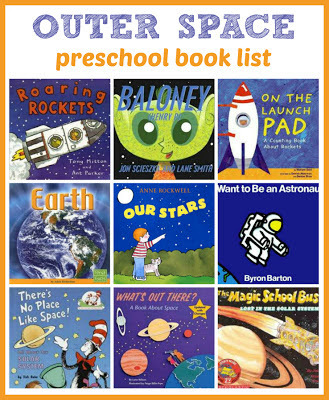 Since my boys like to "space out" daily and venture to planets far, far away during playtime, I've been collecting lists of favorite outer space books. Here are a few of our favorites. The links in this post are affiliate links. Clicking on the link or the image of the book will take you to the book on Amazon for your convenience. 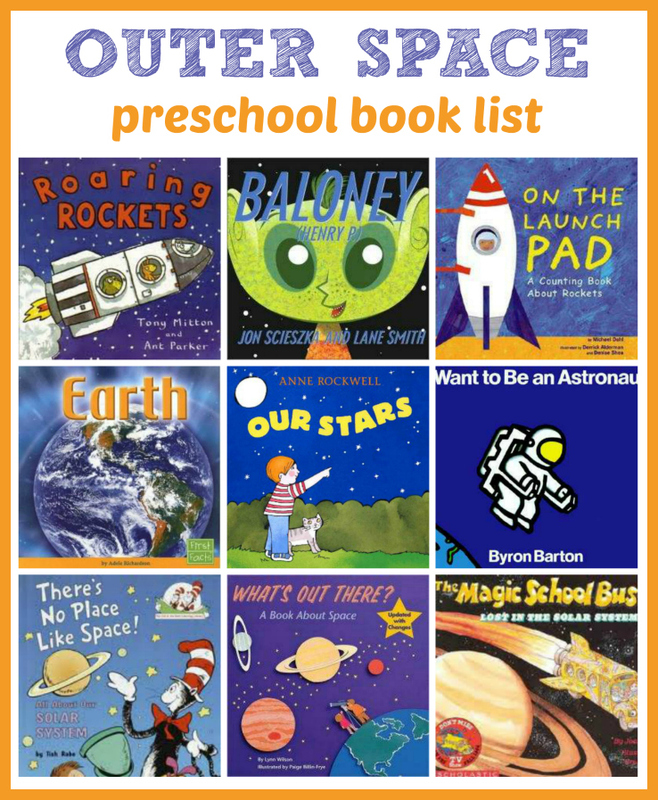 I Want to Be an Astronaut Byron Barton is a great preschool outer space pick. In this story, a child imagines going on a visit to outer space as an astronaut. The book details the jobs of astronauts, what they eat, what they wear, how they travel, and more topics that will interest kids. On the Launch Pad: A Counting Book About Rockets (Know Your Numbers) This fun picture book was recommended by +Jodie Rodriguez of +Growing Book by Book in the Picture book of the day series that I participate in with several other bloggers. I blasted off to the library to check out this fun counting book. I love that it counts backwards from 12 as it counts down all of the steps toward getting a rocket ready to launch into space. Jodie also shared a great resource of Outer Space activities and crafts as well as several other outer space themed books in The Good Long Road's Things that Go! In Space! series. Roaring Rockets (Amazing Machines) by Tony Mitton explores the jobs that rockets do in traveling to space in a simple rhyming text. Our Stars by Anne Rockwell is great informative text for young readers. Each page features a large illustration and a few lines of text. Although the book does give information about stars, it also gives information about constellations, planets, orbits, and more. What's Out There? : A Book about Space (Reading Railroad) What's out there? A Book about Space by Lynn Wilson is another informational text for preschool. If you have a child who asks a million questions about the solar system, this book is a great place to start. It provides a lot of great details but keeps the information simple. The bright collage illustrations capture kids attention as well. The Magic School Bus Lost In The Solar System Jump on the Magic School Bus and take a trip through the solar system with Mrs. Frizzle's class. The class tries to visit the Planeterium. When it is closed down, Mrs. Frizzle magically converts the school bus to a rocket ship. The class visits outer space, stopping at each planet to explore and learn facts about that part of our solar system. While the text is obviously fiction, there are informational paragraphs written by the students of Mrs. Frizzle's class on each page. The version of this book that I have includes Pluto as a planet. I'm not sure if this one has been updated yet? There's No Place Like Space: All About Our Solar System (Cat in the Hat's Learning Library) There's no Place like Space by Tish Rabe This is a Cat in the Hat learning library book exploring outer space. It provides a lot of information on planets and constellations in a fun rhyming text. The familiar characters make it extra appealing to most kids. This book is also available as an app for iPad from Oceanhouse Media. I adore their apps, they are very well done and engaging for kids. This nonfiction book about the planet Earth is good for preschool children. It combines large, simple photos and illustrations along with one factual paragraph per page. Each page covers a different topic about the planet such as distance from the sun, planet make up, atmosphere, how it moves, and more. It is also good for allowing young readers to experience the text elements of nonfiction text as it includes table of contents, headings, labels, charts, glossary, and index. This series includes all of the planets and the sun and the moon and my five year old has requested that we read all of them many times! 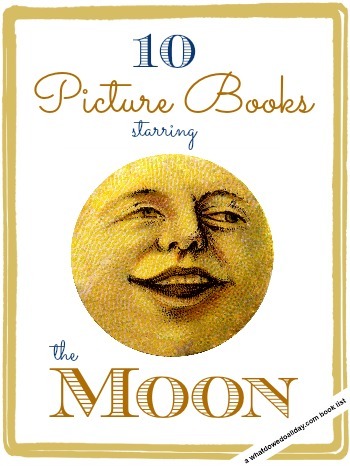 There are tons of picture books that focus on the moon. +Erica MomandKiddo has done an amazing book list of the top 10 picture books about the moon on What Do We Do All Day? These are fiction books that star the moon and are meant to bring out the mystery, beauty, and inspiration of the moon. Adding these types of books to your outer space theme, will make your unit well rounded. Baloney (Henry P.) Of course, in every outer space unit, you have to throw in at least one alien book. Who doesn't love aliens? We've been loving Baloney (Henry P.) by Jon Scieszka and Lane Smith. This book was recommended by +PragmaticMom . Check out her review as well as a list of other alien books. For activities to go with this theme, check out my preschool themes pinterest board. Do you have any favorite books for outer space? Space is such a fascinating topic to learn more about. I had a post on our favorite space books which were more "non-fiction" here - http://learningwithmouse.blogspot.com/2011/01/space-travel-and-space-collage.html. I am now considering letting Anna read Ender's Game - I loved this book when I was a kid! We just got the Magic School Bus one from the library! I think we'll have to look for Baloney (Henry P.) now too!